The guesthouse has 10 rooms, which all feature en-suite baths or showers, televisions with DStv, Wi-Fi, air-conditioning and tea and coffee facilities. The abode also offers guests a communal dining area, laundry amenities, a swimming pool and safe parking on the premises. Also on the premises is a restaurant which serves delicious South African dishes and a private bar at which to relax after a long day. Conference facilities are also available for up to 50 people. Guests can enjoy many great attractions in and around the area, such as the Franklin Nature Reserve, the Free State National Botanical Gardens and the Mangaung Cultural Route. "Was a lovely stay with a wonderful meal. The host was very considerate towards our cats which was appreciated. The room was lovely and had welcoming feel to it. Will visit again." 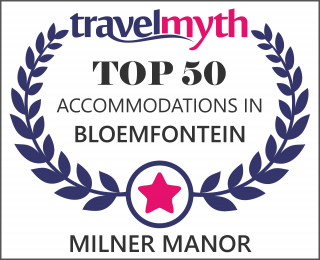 "Milner Manor was a pleasure, the breakfast was great and they were very accommodating to our early check out time. I would gladly stay there again. A great BnB." "Manie is a wonderful and fantastic host. They spoiled us rotten, from chocolate brownies, sherry in our room as well as great breakfast and dinners. Thank for a wonderful stay, we'll definitely be back."